Seems like that company has bought up a load of old titles too, including a few Humongous Entertainment games (Pyjama Sam, Putt Putt, and so on). The more I see about this re-release, the more I wonder if the lost episode might have been better off remaining lost. At least the source was released. Now i'm getting even more confused here. Who/what presently owns the rights to Keen anyway? And if a new game idea/project were to be pitched to revive the series, would it be that same person/outfit? And how 'should' an approach like that be made for a pitch? Forgive the noobish nature of this reply, it's been on my mind too much I guess. Personally, I'd feel 100% confident that a lot of us can do that somehow. Sonic Mania development comes to mind here. The fans making the impossible 'possible' .. Keen deserves the same kind of treatment, I believe. Thoughts? Actually, Bethesda owns Keen + Id Software, too if I remember right. As for Keen Dreams, the rights have been purchased by a company (? ), who also released the source code of the game. Moreover, Keen Dreams has a commercial and non-commercial version (which is shareware). Hard Disk Publishing bought Dreams with support from a crowd funding campaign, but they only bought the rights to that game and not free reign over the IP. That, as szemi said, is rotting in the hands Id Software's parent company. Sonic's fanbase is huge and active, whereas Keen's active fanbase is much smaller. The game is just a happy childhood memory for many people. I'm not familiar with the Sonic Mania backstory, but I suspect the scale of Sonic's active fanbase was integral. Thanks so much for the replies to my questions. I honestly don't know where I want to go with my talents now. I've always thought that we could develop an actual release to revive the Keen series. The modding work was always fun, but it's starting to become a problem for me to be doing so much work for "unofficial" games. I really don't see why we can't do a Steam release. Maybe even for multiple platforms too? Something for the whole world to be able to discover Keen or live those childhood memories again. Sonic Mania is a big time problem for me because they thought it was okay to use my level designs for a zone and I'm not credited anywhere for anything even having known the developers personally. Nobody reached out to me! So that was a huge kick in the pants! On top of that, I actually attended college for Entertainment Production Business, a course offered at the local campus. So I feel like i'm just wasting away my talents on things that will never be a 100% real, licensed product. If you want your work to be released as a commercial product (and want to get paid for it), you should not expect that to happen with a mod for a 26+ year old game that - let's face it - nobody seems to care about these days. Create your own universe, so you actually own the IP and don't have to pay royalties for a Keen license (or any license, really). Then find a game engine that you can work with, since anything that relies on patched versions of the original Keen 1-6 executables is not a viable solution for a commercial product. It's understood that a lot of steps would (and should) be involved to develop a game commercially. I'm very much willing to take the journey to at least try. I'd imagine some of the names/developers listed on that Keen Dreams store page could open the door for us. I don't really know. It's Commander Keen and Sonic the Hedgehog that interest me in a development perspective. As for creating my own game from scratch, I really don't have the desire for that and never have. I just really don't see any reason why there can't be an approach taken to develop a new CK game for PC/Steam at some point - if we're given that opportunity. 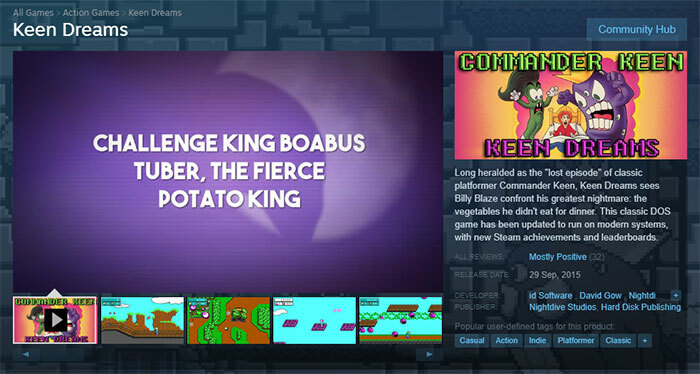 Don't mean to be way off topic here, but it was kinda related because a store page exists and I really didn't know that (for any CK games for that matter) until I saw the post on here. If you want to have a chance at a commercial game you can't just ask someone - that's like going up to a movie producer and saying "hey I have this great idea for a movie!" You and about a million other people, most of whom will give up as soon as the hard work starts. So nobody is going to listen. Instead, you have to produce something worthwhile so you can go to them and say "hey, I'm looking for someone to publish this mostly finished game", and at that point they can decide whether it's worth it or not. As K1n9_Duk3 says, most people aren't going to be interested in publishing old Keen games, especially if you haven't sorted out IP arrangements ahead of time as those can be a minefield of negotiations - if you even know who to approach. If you're serious about getting a commercial release, I'd recommend looking at one of the commercial game engines, like Unreal Engine or the handful of others. Most of these are free for small games, and you only start paying royalties to the engine developer once your sales go past a certain amount. Many of them will let you publish mobile games which means you can actually start selling your game pretty easily (and if that's not a commercial release I don't know what is!) Even if you don't sell your game, you will have a showpiece to approach other developers with, and experience with using a modern game engine which will make it easier for you to collaborate with other development teams. Although sorting out IP would make it difficult, I certainly wouldn't mind playing a Commander Keen game in the spirit of the originals but done with a modern game engine! I understand everything that you're saying and I do appreciate the information. Some clarification is needed though. Selling a game really isn't on my agenda right now. I only want to find out if we can get the door open for development, a reason to try with some sort of promise. If we knew for sure that there's a good chance of it being accepted through 'so and so publisher' then at that point there's a reason to get cracking on it. I thought it would just be a matter of contacting some people to find out if they would accept ideas outside of their company. Not pitching the idea right off the bat and hoping that they like it. It sounds like you've already made your mind up that it's something you want to do, so in that case you may as well do it whether it will be accepted or not. There are worse things you could spend your free time on. A revival game after 25 years wouldn't be the problem, the issue would be whether a company would make a financial return on the effort they have to put in to publish it. If the IP isn't sorted out then they risk being sued, if the game isn't finished then they risk backing something that never happens, but if you go to probably any publisher with a finished game and all the rights sorted, so the publisher has to do basically nothing, then I don't think you'd have a problem. We got The Emoji Movie. Evidently the movie business don't have that high a bar for entry. This is all very interesting. ha Well, I'm going to continue to develop and hopefully finish the new engine. A fresh, new topic will be made for that when the time comes. And a new mod is still on the front burner that those of us working on it feel very confident that you'll all enjoy it. Thanks again for the replies, all! Keep on modding!